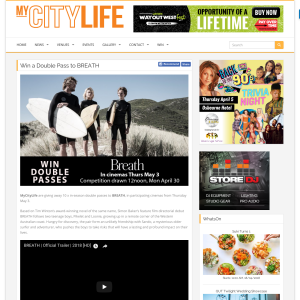 MyCityLife are giving away 10 x in-season double passes to BREATH, in participating cinemas from Thursday May 3. Based on Tim Winton’s award-winning novel of the same name, Simon Baker’s feature film directorial debut BREATH follows two teenage boys, Pikelet and Loonie, growing up in a remote corner of the Western Australian coast. Hungry for discovery, the pair form an unlikely friendship with Sando, a mysterious older surfer and adventurer, who pushes the boys to take risks that will have a lasting and profound impact on their lives. The competition will be drawn 12noon, Monday April 30 and winners will be contacted by email. For your chance to win a double pass to BREATH, fill in the details below.